This bracelet display is made from clear acrylic, which makes it a durable piece that you can enjoy for a long time. It has a contemporary style, which allows you to easily display your favorite bracelets and watches in front of your potential buyers. It has a round bar that you use for hanging your jewelry and accessories. The bar is attached to a solid base, through a pole. The base of this display is solid and it features a rectangular shape, which increases the stability of the display stand when it is in use. Therefore, you don’t need to worry that it may tip or fall when you use it to showcase your precious bracelets, necklaces and watches. 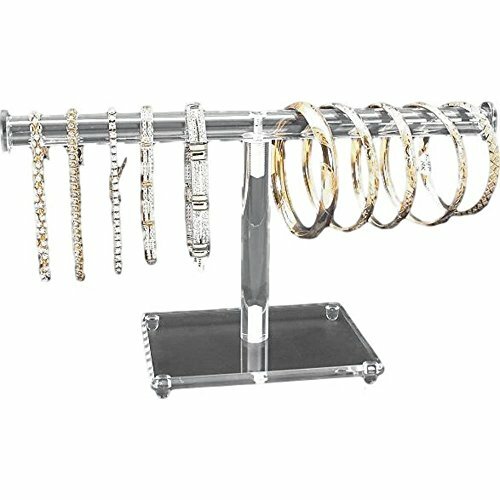 Put your jewelry in the limelight with this Clear Acrylic Round T-bar Bracelet Display. It is perfect for any jewelry store, but also for personal use, in your room. This display looks great and it brings its functionality to allow you to keep your bracelets, watches and necklaces organized. Featuring a dimension of approximately 254 x 123.6 mm, this display doesn’t take too much storing space, so you can nicely display it in your storefront window, on the countertop, on the shelf, in a display case, or on your dressing table. 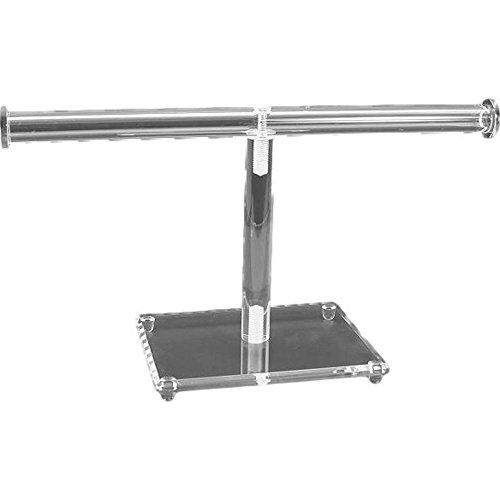 The base stands on four rounded legs, which offer an elegant and nice appeal to this bracelet T-bar display stand. At the both ends of the display bar, there are caps, which make sure that your displayed jewelry and accessories don’t fall from the bar.